The Karman® Universal Folding Headrest is designed to fit wheelchairs with 7/8″ tubing, and it folds with the wheelchair so it does not need to be removed. It features a great deal of adjustability, including height and depth adjustments for maximum comfort. It’s padded headrest has a breathable surface texture allowing maximized comfort and durability. Karman Healthcare’s new wheelchair folding headrest is perfect for all wheelchair users who are looking for added comfort at an economical price. The aluminum frame allows strength and lightness not found in other steel hardware for standard headrests. Finding a balance for comfort and a well positioned support for your daily aid needs is important for prolonged usage in a wheelchair. Check out our wheelchair category and ask a dealer to see which product you can accessories with today. 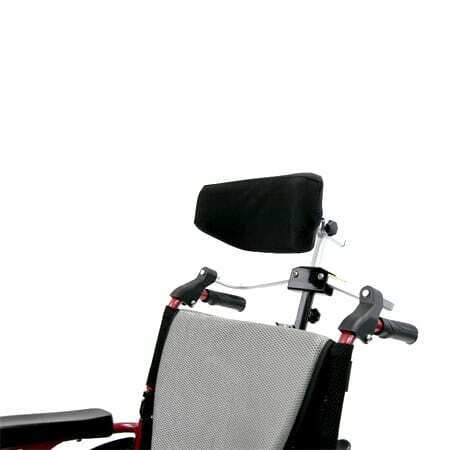 Patented design allows for folding when collapsing wheelchair. No tools needed, no removal needed when folding and storing wheelchair. This headrest for wheelchairs fits only 7/8″ tubing, most manual chairs come with this width which is perfect for this headrest.